Review: This tells the story of the Beach Boys leader Brian Wilson. It shows two key periods in his life. One during the 1960’s and then the 1980’s. A very interesting story that I knew nothing about. 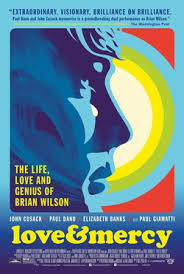 In this film it just shows how passionate Brian Wilson was and how driven he was. He waned to get everything spot on. Paul Dano’s singing is fantastic and to think that he sang all of the songs himself. The score was brilliant. The cinematography was well captured. Great performances from John Cusack and Paul Dano. Both never actually met on set. Well directed by Bill Pohlad. In order for Paul Dano to play Brian Wilson he had to gain 35 pounds in weight. Paul Dano once actually played in a band and was really directing the actors on how to play their instruments. Watching this I did feel that Paul Dano did understand the music industry and how it all works. They themselves were actual real-life musicians. Apparently there have been two films already about Brian Wilson. One was called Summer Dreams: The Story of the Beach Boys (1990) and also The Beach Boys: An American Family (2000).